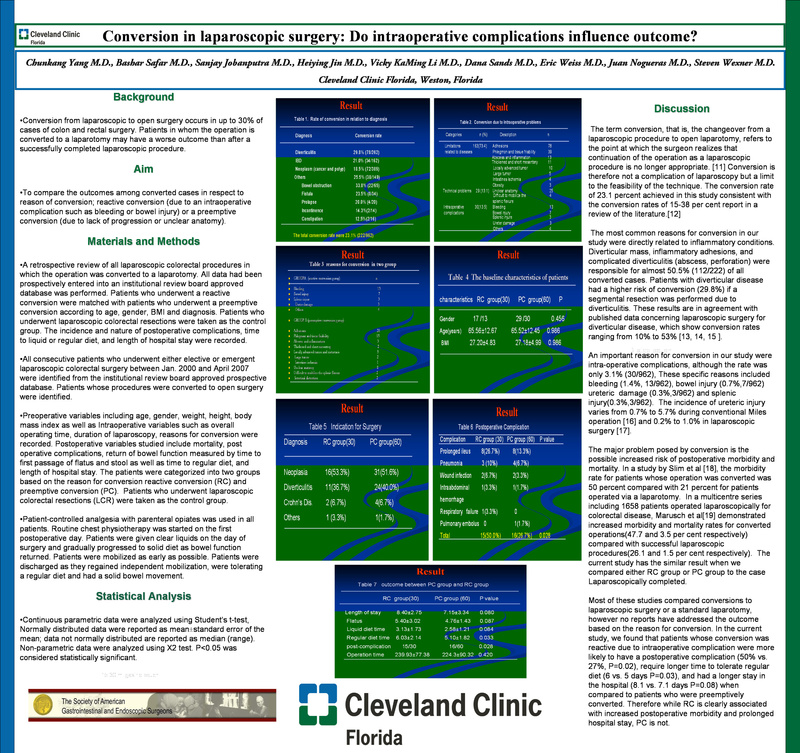 Conversion in laparoscopic surgery: Do intraoperative complications influence outcome? Background: Conversion from laparoscopic to open surgery occurs in up to 30% of cases of colon and rectal surgery. Patients in whom the operation is converted to a laparotomy may have a worse outcome than after a successfully completed laparoscopic procedure. The aim of this study was to compare the outcome of converted cases based on whether the case was a reactive conversion (due to an intraoperative complication such as bleeding or bowel injury) or a preemptive conversion (due to lack of progression or unclear anatomy). Methods: After IRB approval, a retrospective review of all laparoscopic colorectal procedures in whom the operation was converted to a laparotomy was performed. Patients who underwent a reactive conversion were matched with those who underwent a preemptive conversion. The incidence and nature of postoperative complications, time to regular diet, and length of hospital stay were recorded. Results: A total of 222/962 laparoscopic procedures were converted to a laparotomy between 2000 and 2007. The 30 patients who underwent a reactive conversion were matched with a group of 60 patients who underwent preemptive conversions. The reasons for reactive conversion were bleeding in 14, bowel injury in 6, ureteric damage in 3, splenic injury in 3, and other complications in 4 patients. Patients who sustained reactive conversions were more likely to develop a postoperative complication (50% vs 27%, p=0.028), require longer time to tolerate a regular diet (6 vs 5 days; p=0.03), and had a longer hospital stay (8.1 vs 7.1 days; p=0.08). Conclusion: Preemptive conversion is associated with a better outcome when compared with reactive conversion. Based on this finding, it appears preferable for the surgeon to have a low threshold to employ preemptive conversion rather than awaiting the need for a reactive conversion.